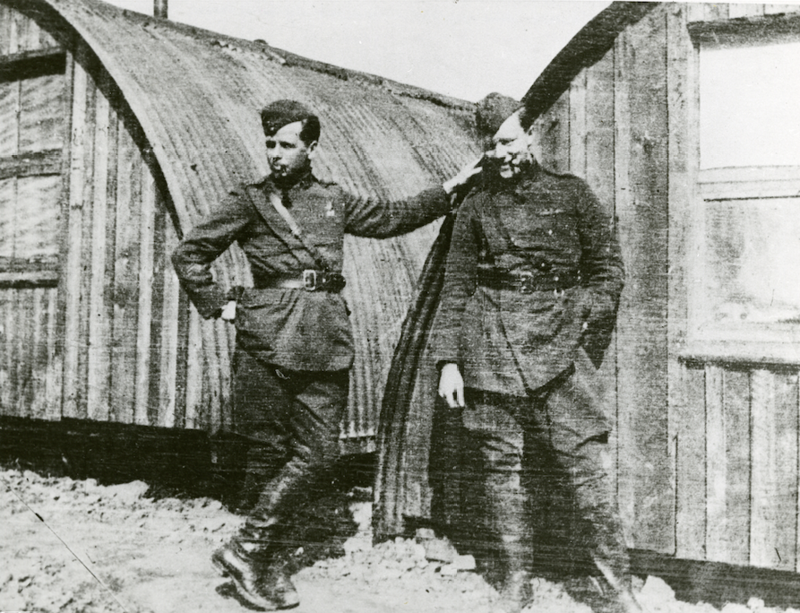 The 1st Aero Squadron, I Corps Observation Group, First United States Army, under the command of Colonel William Mitchell, Aviation Section, Signal Corps, United States Army, made its first combat patrol over the front lines from their airfield at Ourches, France. 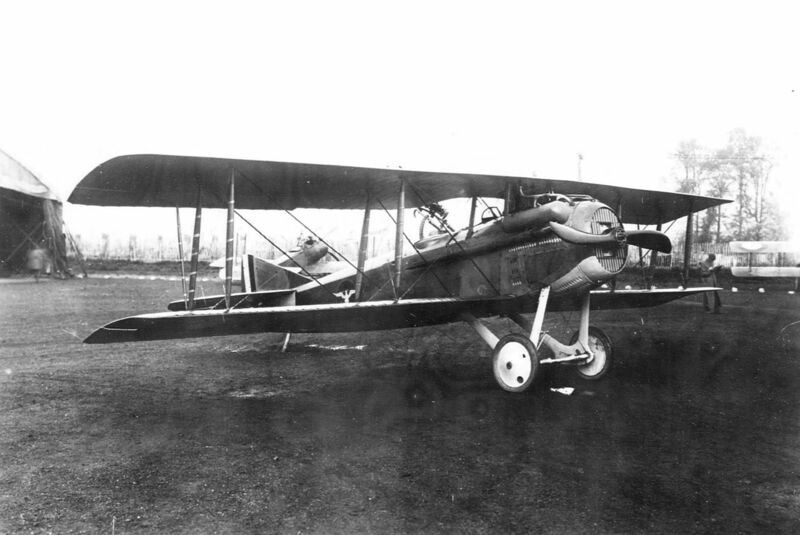 They were equipped with the two-place Société Pour L’Aviation et ses Dérivés SPAD S.XVI A.2. They patrolled the lines, scouted troop movements, and took photographs in support of the U.S. Army I Corps and French XXXVIII Corps. This was the first United States air unit in combat during World War I. 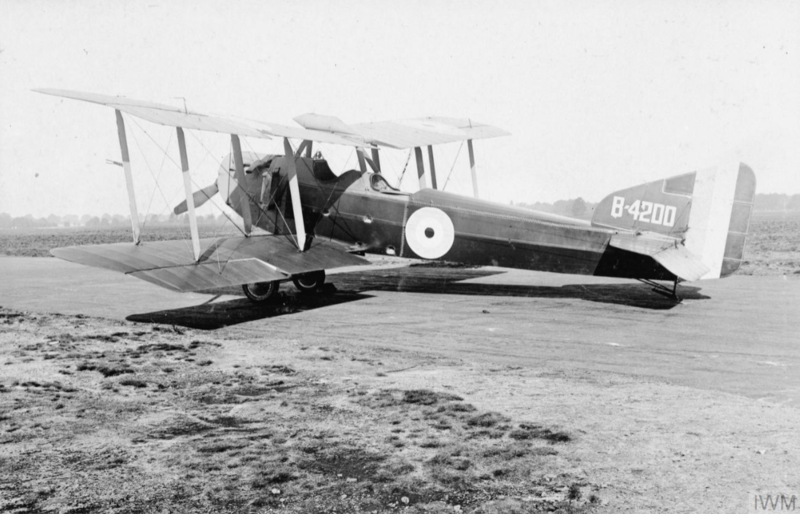 The SPAD S.XVI was intended as an improvement of the earlier SPAD S.XI A.2, which was a two-place development of the SPAD S.XIII C.1 fighter. 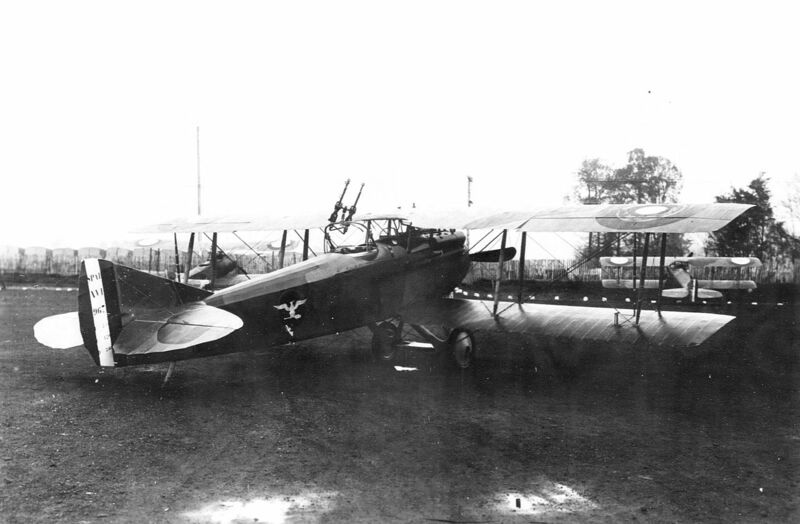 The S.XVI is single-engine, two-place, two-bay biplane with fixed landing gear. It was crewed by a pilot and observer/gunner. The wings are swept aft approximately 4° and are staggered, moving the center of lift aft to compensate for the airplane’s longer fuselage. The lower wing’s chord is significantly narrower than the upper. Ailerons are on the upper wing only. The S.XVI A.2 is 7.707 meters (25 feet, 3.425 inches) long with an upper wingspan of 11.220 meters (36 feet, 9.732 inches) and lower span of 10.900 meters (35 feet, 9.133 inches). Its height is 2.850 meters (9 feet, 4.211 inches) with the fuselage in a level attitude. The airplane has an empty weight of 906 kilograms (1,997 pounds) and gross weight of 1,140 kilograms (2,513 pounds). The SPAD XVI was powered by a right-hand tractor, water-cooled, normally-aspirated, 16.286 litre (993.834 cubic inches) La société industrielle Lorraine-Dietrich 8Be single overhead cam 90° V-8 direct-drive engine which produced 270 cheval-vapeur (270.09 horsepower) at 1,900 r.p.m. The engine weighed 260 kilograms (573 pounds). The SPAD S.XVI was armed with one fixed forward firing, water-cooled, .303-caliber (7.7 mm) Vickers Mk.I machine gun and two air-cooled .303-caliber Lewis Mk.2 light machine guns on a flexible mount in the aft cockpit. Because of the cold temperatures at altitude, the Vickers’ water jacket was not filled, thereby saving considerable weight. The airplane could also carry small bombs attached to the lower wing. Approximately 1,000 SPAD S.XVIs were built. Six were obtained by the United States. 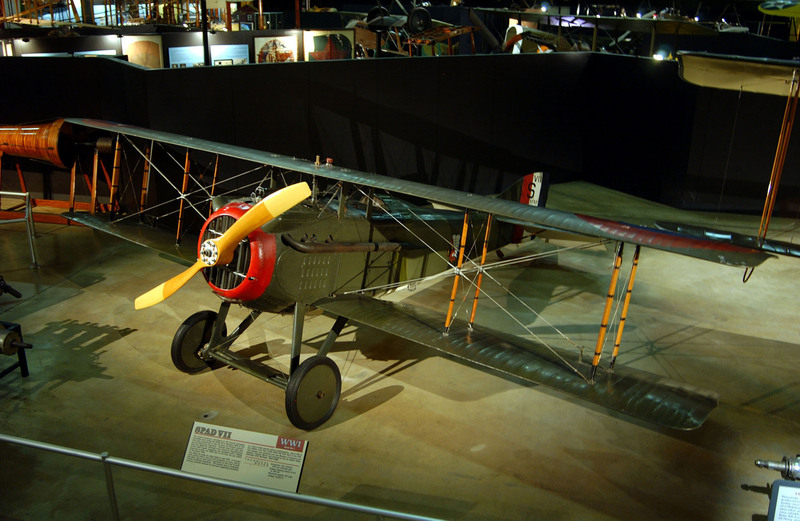 Mitchell’s personal SPAD S.XVI, serial number 9392, is on display at the Smithsonian Institution National Air and Space Museum, Steven F. Udvar-Hazy Center, Chantilly, Virginia. 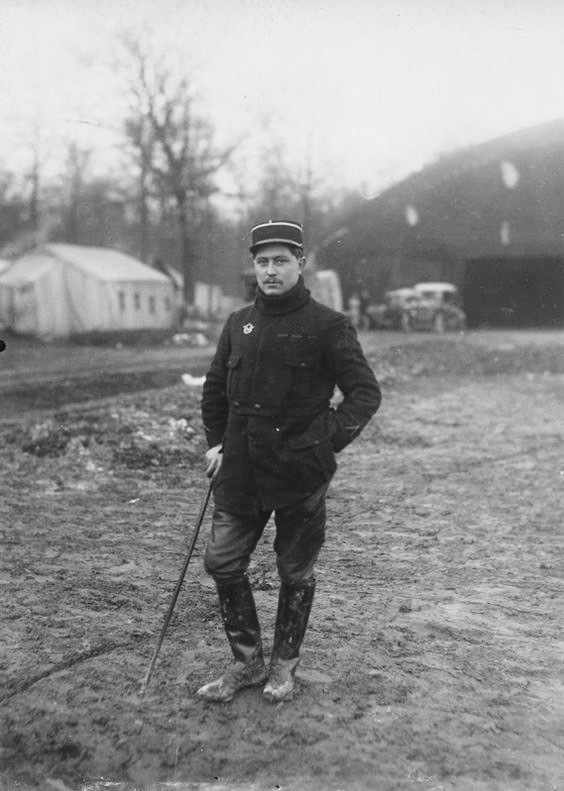 Sous-Lieutenant René Pierre Marie Dorme, Escadrille No. 3, Aéronautique Militaire. 4 April 1917: Sous-Lieutenant René Pierre Marie Dorme of the Aéronautique Militaire (French Air Service) made the first flight of the famous World War I fighter, the SPAD S.XIII C.1. Lieutenant Dorme was an ace with 18 confirmed victories. In the next seven weeks, he shot down another five enemy aircraft. 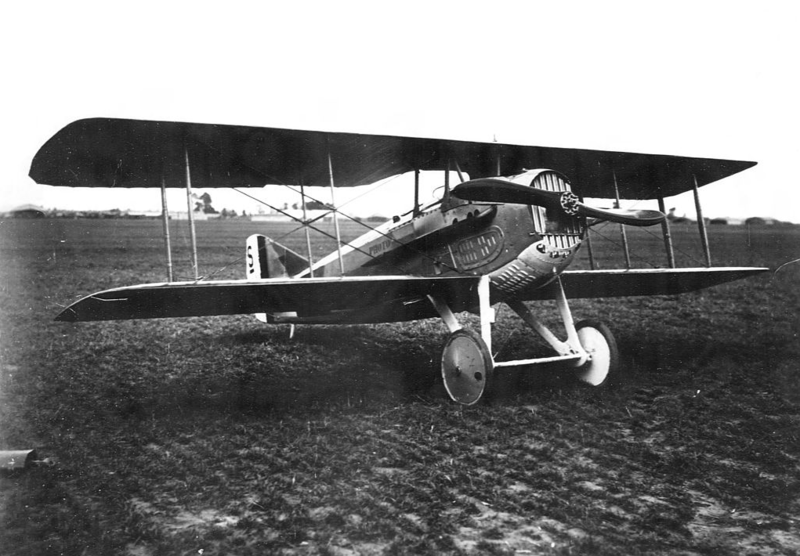 Designed by Société Pour L’Aviation et ses Dérivés Technical Director Louis Béchéreau and manufactured by SPAD as well as eight other companies, this was an improved and slightly larger version of the earlier SPAD S.VII C.1. It used a more powerful Hispano-Suiza 8Ba engine instead of the S.VII’s 8Aa, with an increase of 50 horsepower. (Later versions used 8Be engines.) Armament was increased from a single .303-caliber Vickers machine guns to two. The SPAD was faster than other airplanes of the time and it had a good rate of climb. Though a product of France, it was used by both the Royal Flying Corps and the U.S. Army Air Service. In France, the airplane type now considered a “fighter” was called a chasseur (“hunter”). The letter “C-” in the SPAD’s designation reflects this. The “-.1” at the ending indicates a single-place aircraft. The SPAD S.XIII C.1 was a single-seat, single-engine, two-bay biplane constructed of a wooden framework with a doped fabric covering. Sheet metal covered the engine and cockpit. The S.XIII was 20 feet, 4 inches (6.198 meters) long.¹ The upper and lower wings had equal span and chord. The span was 26 feet, 3¾ inches (8.020 meters) and chord, 4 feet, 7-1/8 inches (1.400 meters). The vertical spacing between the wings was 3 feet, 10½ inches (1.181 meters), and the lower wing was staggered 1¼° behind the upper. Interplane struts and wire bracing was used to reinforce the wings. The wings had no sweep or dihedral. The angle of incidence of the upper wing was 1½° and of the lower, 1°. Only the upper wing was equipped with ailerons. Their span was 7 feet, 3½ inches (2.222 meters), and their chord, 1 foot, 7½ inches (0.495 meters). The total wing area was 227 square feet (21.089 square meters). The horizontal stabilizer had a span of 10 feet, 2 inches (3.099 meters) with a maximum chord of 1 foot, 8¾ inches (0.527 meters). The height of the vertical fin was 2 feet, 7/8-inch (0.876 meters) and it had a maximum length of 3 feet, 11¼ inches (1.200 meters). The rudder was 3 feet, 10-5/8 inches high (1.184 meters) with a maximum chord of 2 feet, 2 inches (0.660 meters). 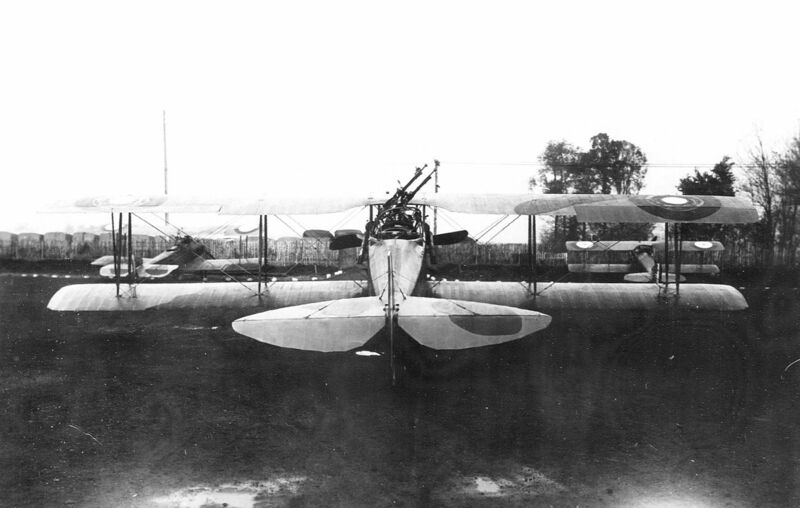 The SPAD S.XIII C.1 had fixed landing gear with two pneumatic tires. Rubber cords (bungie cords) were used for shock absorption. The wheel track was 4 feet, 10¾ inches (1.492 meters). At the tail was a fixed skid. The airplane had an empty weight of 1,464 pounds (664 kilograms), and gross weight 2,036 pounds (924 kilograms). 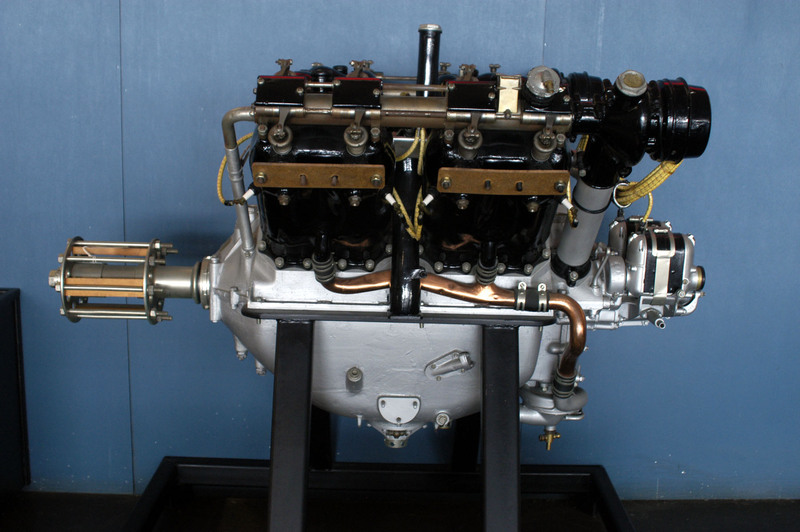 Initial production SPAD XIIIs were powered by a water-cooled 11.762 liter (717.769-cubic-inch displacement), La Société Hispano-Suiza 8Ba single overhead cam (SOHC) left-hand-tractor 90° V-8 engine. It was equipped with two Zenith down-draft carburetors and had a compression ratio of 5.3:1. The 8Ba was rated at 150 cheval vapeur (148 horsepower) at 1,700 r.p.m., and 200 cheval vapeur (197 horsepower) at 2,300 r.p.m. It drove a two-bladed, fixed-pitch, wooden propeller with a diameter of 2.50 meters (8 feet, 2.43 inches) through a 0.585:1 gear reduction. (The 8Be engine had a 0.75:1 reduction gear ratio and used both 2.50 meter and 2.55 meter (8 feet, 4.40 inches) propellers.) The Hispano-Suiza 8Ba was 1.36 meters (4 feet, 5.5 inches) long, 0.86 meters (2 feet, 9.9 inches) wide and 0.90 meters (2 feet, 11.4 inches) high. It weighed 236 kilograms (520 pounds). The SPAD S.XIII C.1 was developed from the earlier SPAD S.VII C.1. 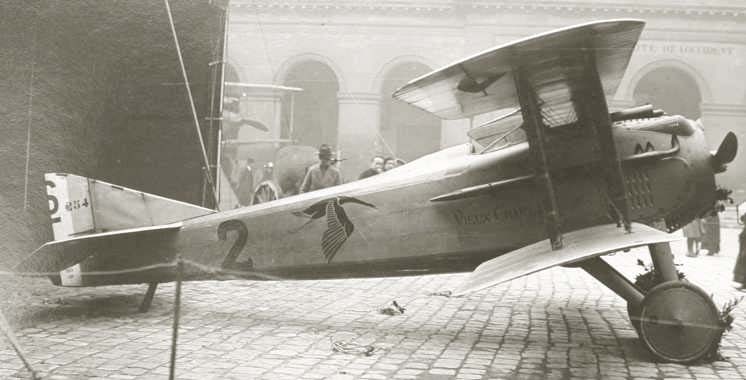 This is Capitaine Georges Guynemer’s SPAD S.VII C.1, N° S 254, “Vieux Charles,” at the Musée de l’Armee. The flowers on the landing gear are a tribute the the fighter ace following his death, 11September 1917. Today, this airplane is in the collection of the Musée de l’Air et de l’Espace at Le Bourget Airport. The airplane had a main fuel tank behind the engine, with a gravity tank located in the upper wing. The total fuel capacity was 183 pounds (83 kilograms), sufficient for 2 hours, 30 minutes endurance at full throttle at 10,000 feet (3,048 meters), including climb. There was also a 4.5 gallon (17 liters) lubricating oil tank. The SPAD S.XIII had a maximum speed of 135 miles per hour (218 kilometers per hour) at 6,560 feet (2,000 meters) and a service ceiling of 21,815 feet (6,650 meters). The chasseur was armed with two fixed, water-cooled, .303-caliber (7.7 mm) Vickers Mk.I machine guns with 400 rounds of ammunition per gun, synchronized to fire forward through the propeller arc. Because of the cold temperatures at altitude, the guns’ water jackets were not filled, thereby saving considerable weight. 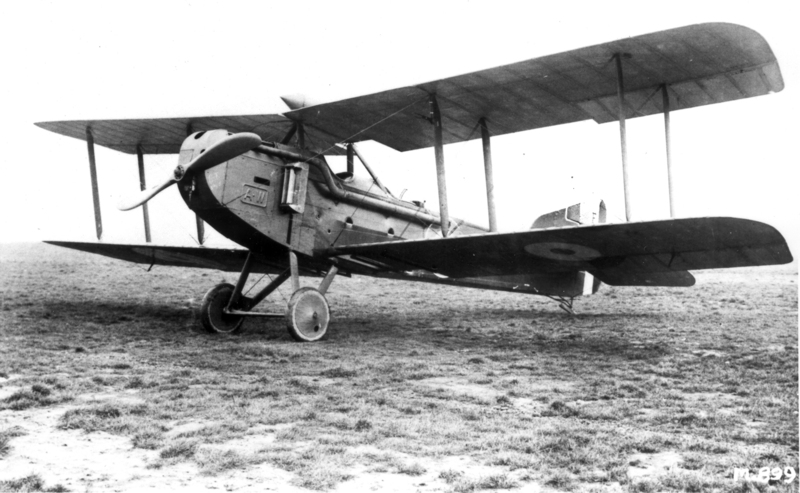 The SPAD S.XIII was produced by nine manufacturers. 8,472 were built. Only four are still in existence. The airplane in the photograph above is SPAD S.XIII C.1, serial number 16594. It was built in October 1918 by Kellner et ses Fils, an automobile manufacturer in Paris, France. It did not see combat, but was shipped to the United States at the end of the War and was stationed at San Diego, California. 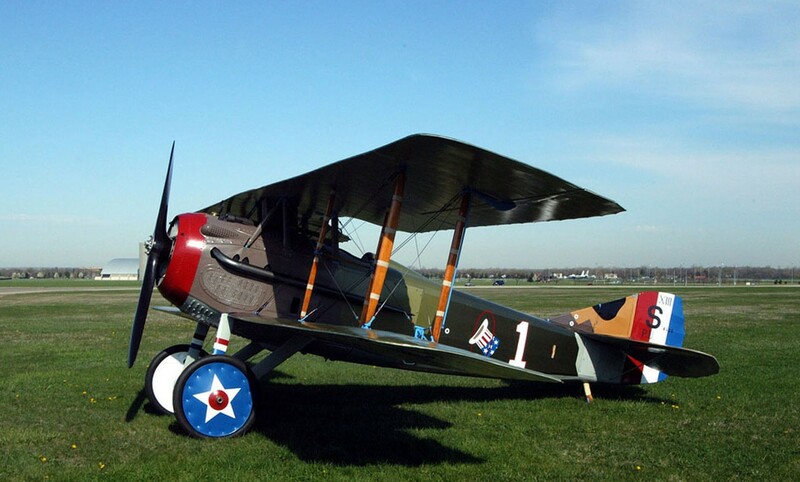 The airplane was restored by the National Museum of the United States Air Force and is painted in the markings of the airplane flown by Captain Edward V. Rickenbacker, commanding officer of the 94th Aero Squadron, American Expeditionary Forces. It is on display at NMUSAF, Wright-Patterson Air Force Base, Ohio. The airplane in the photograph below is another SPAD S.XIII C.1, serial number 7689, also built by Kellner et ses Fils, in August 1918. 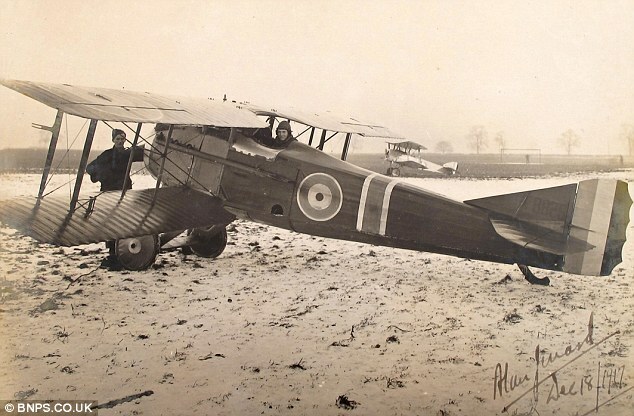 It was sent to the 22nd Aero Squadron at Colombey-les-Belles and assigned to Lieutenant Arthur Raymond Brooks. Brooks’ fiancée attended Smith College and he named the SPAD Smith IV in her honor. With this airplane, Lieutenant Brooks shot down six enemy airplanes. Other pilots also flew it to shoot down another five. After the War came to an end, 7689 was shipped to the United States and used in a Liberty Bond fund-raising tour. 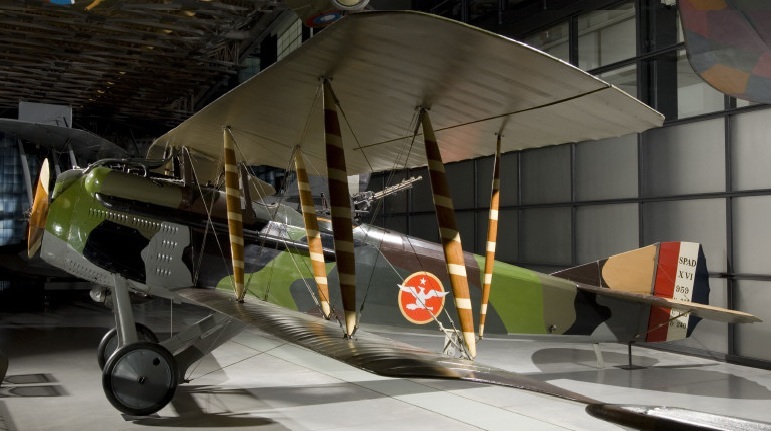 In December 1919, the United States Army gave the fighter to the Smithsonian Institution. It was restored at the Paul E. Garber Center, 1984–1986, and remains in the collection of the National Air and Space Museum. René Dorme fought 120 aerial engagements, many while flying a SPAD S.VII C.1. He is officially credited with 22 victories, and may have shot down as many as 59 enemy aircraft. His personal airplane was marked with a green Cross of Lorraine. He was a Chevalier de la légion d’honneur, and had been awarded the Médalle Militaire and the Croix de Guerre with 17 Palms. Dorme was killed in action 25 May 1917 when his SPAD VII was shot down by Oberleutnant Heinrich Kroll of Jasta 9 at Fort de la Pompelle near Reims. 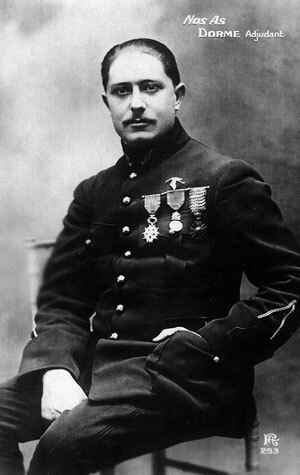 Sous-lieutenant René Pierre Marie Dorme, Aéronautique Militaire, Chevalier de la légion d’honneur. ¹ Dimensions, weights, capacities and performance data cited above refer to SPAD S.XIII C.1 serial number 17956 (A.S. 94101), which was tested at McCook Field, Dayton, Ohio (Project Number P-154), 1921. When on an offensive patrol with two other officers he attacked five enemy aeroplanes and shot down one in flames, following it down within one hundred feet of the ground. He then attacked an enemy aerodrome from a height of only fifty feet from the ground, and, engaging single-handed some nineteen machines, which were either landing or attempting to take off, succeeded in destroying one of them, which crashed on the aerodrome. A large number of machines attacked him, and whilst thus fully occupied he observed that one of the pilots of his patrol was in difficulties. He went immediately to his assistance, regardless of his own personal safety, and destroyed a third enemy machine. Fresh enemy aeroplanes continued to rise from the aerodrome, which he attacked one after another, and only retreated, still engaged with five enemy machines, when ordered to do so by his patrol leader. Although apparently wounded, this very gallant officer turned repeatedly, and attacked single-handed the pursuing machines, until he was eventually overwhelmed by numbers and driven to the ground. Lt. Jerrard had greatly distinguished himself on four previous occasion, within a period of twenty-three days, in destroying enemy machines, displaying bravery and ability of the very highest order. Both Captain Carpenter and Lieutenant Eycott-Ross were awarded the Military Cross for their actions on this date. Lieutenant Jerrard was presented the Victoria Cross by George V at Buckingham Palace, 5 April 1919. 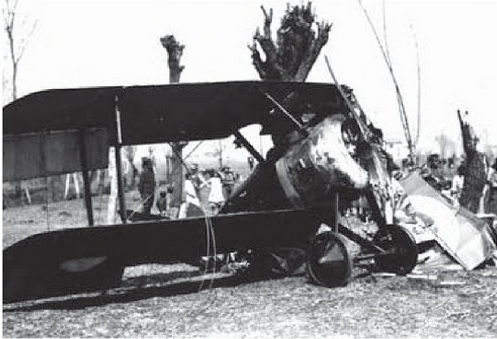 Jerrard’s Sopwith Camel had been shot down by Hauptmann Benno Fiala Ritter von Fernbrugg, an Austrian Air Force ace. This was von Fernbrugg’s fourteenth aerial victory. Alan Jerrard was born 3 December 1897 at Ladywell, Lewisham, southeast London, England. He was the son of Herbert Jerrard, at that time the master of mathematics at St. Dunstan’s College, Catford, London, and Jane Remington Hobbs Jerrard. He attended Bishop Vesey’s Grammar School, Sutton Coldfield, West Midlands, where his father was now headmaster. He went on to Oundle School in Northamptonshire, then attended the University of Birmingham. In 1915, Jerrard joined the British Army. He was appointed a cadet with the Birmingham University Contingent, Senior Division, officers Training Corps. He was commissioned as a second lieutenant in the South Staffordshire Regiment, 2 January 1916. 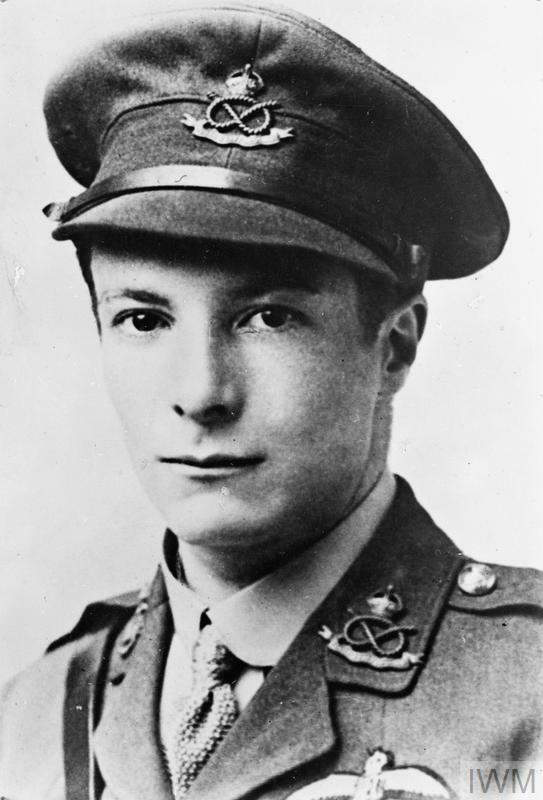 On 16 August 1916, Second Lieutenant Jerrard transferred to the Royal Flying Corps to be trained as a fighter pilot. He completed flight training 14 June 1917. He received advanced training at London Colney. Jerrard was promoted to lieutenant and was assigned to No. 19 Squadron, 24 July 1917. 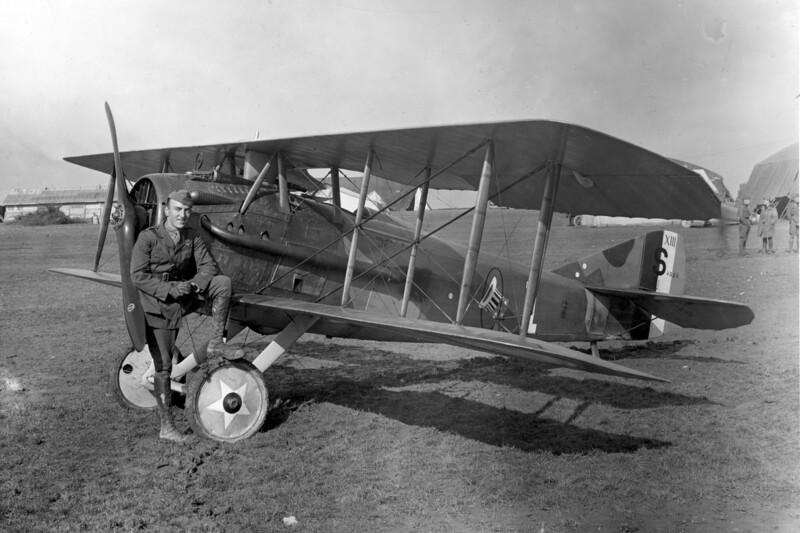 Lieutenant Jerrard was flying a SPAD S.VII on his second combat patrol, 2 August 1917, near St. Marie Cappel. He attacked an enemy convoy, but then his engine failed. He crashed and was seriously injured. Rescued by Allied soldiers, he was initially hospitalized in France before being returned to England to recover. Lieutenant Jerrard was able to return to duty after six months. He joined No. 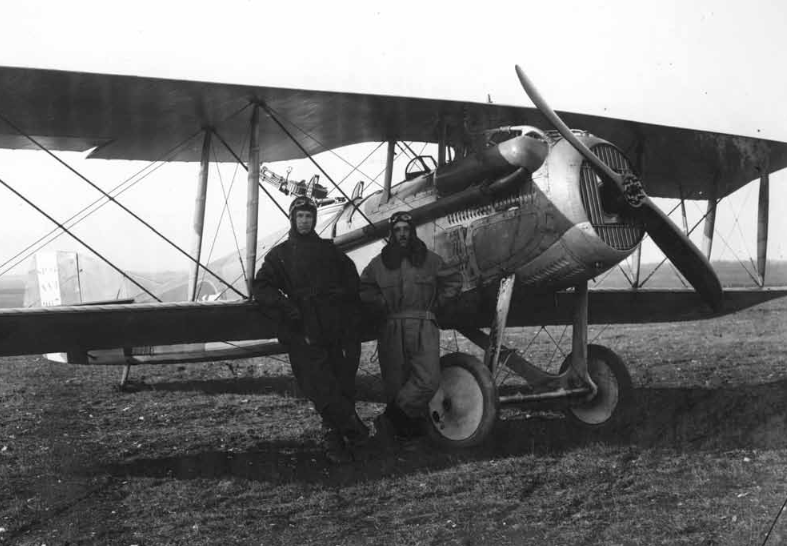 66 Squadron in Italy, 22 February 1918. After being shot down on 30 March, Lieutenant Jerrard was held by Austria as a Prisoner of War at Salzburg. He was later able to escape and return to Allied lines. Lieutenant Jerrard was officially credited with destroying three Albatros D.IIIs on 30 March 1918. In the previous weeks, he had also shot down two Aviatik Berg D.Is, an observation balloon, and another Albatross D.III. In addition to the Victoria Cross, Lieutenant Jerrard was awarded the Medaglia di bronzo al Valore Militare (Bronze Medal for Military Valor) by the Kingdom of Italy. Imperial Russia awarded him the Imperatorskiy orden Sv. 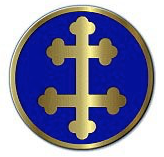 Anny (The Imperial Order of St. Anne, Third Degree, with Swords). 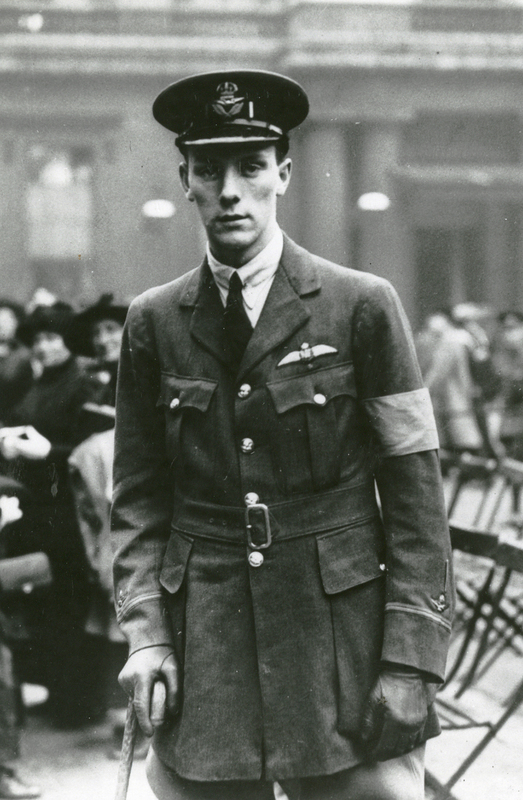 Lieutenant Jerrard remained in the Royal Air Force following the Armistice. He was granted a Permanent Commission as a Flying Officer, effective 1 August 1919. He served with a detachment at Murmansk, Russia, in 1919. On 1 January 1926, Flying Officer Jerrard was promoted to the rank of Flight Lieutenant. 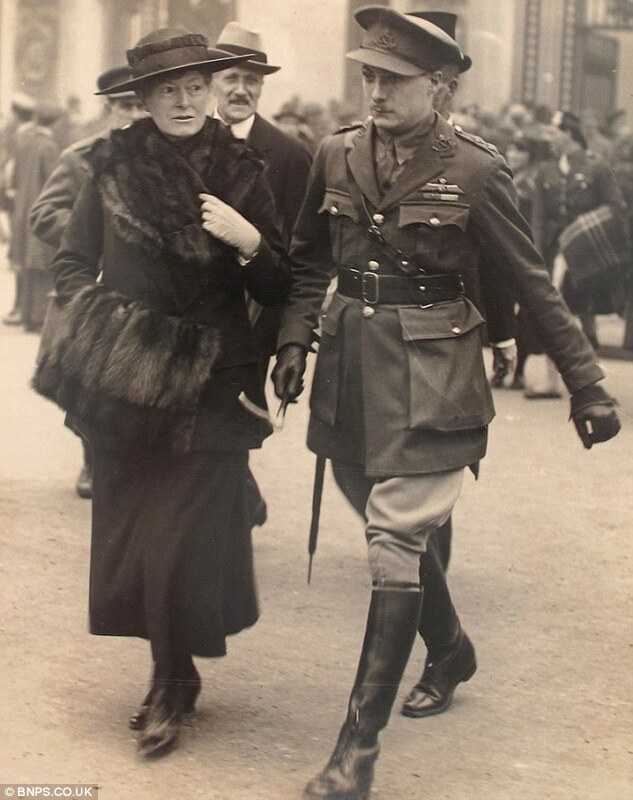 In June 1926, Flight Lieutenant Jerrard married Mrs. Eliza M.K. Low (née Eliza Maria Kathleen Woods), in St. Giles, Westminster, London. Flight Lieutenant Jerrard retired from the Royal Air Force after eighteen years of military service. He was placed on the retired list on account of ill health, 24 August 1933. Flight Lieutenant Alan Jerrard, V.C., died at Lyme Regis, Devon, 14 May 1968. His ashes were interred at the Uxbridge and Hillingdon Cemetery, Middlesex, along with those of his wife Eliza Maria Kathleen, who had died in 1961. Medals of Flight Lieutenant Alan Jerrard, V.C., Royal Air Force, in The Lord Ashcroft Gallery of the Imperial War Museum. (Left to right) Victoria Cross; British War Medal 1914–1920; Victory Medal 1914–1919; King George Coronation Medal 1937; Queen Elizabeth Coronation Medal 1953; Knight, Order of St. Anne with Swords (Imperial Russia); and Medal of Military Valour (Kingdom of Italy). 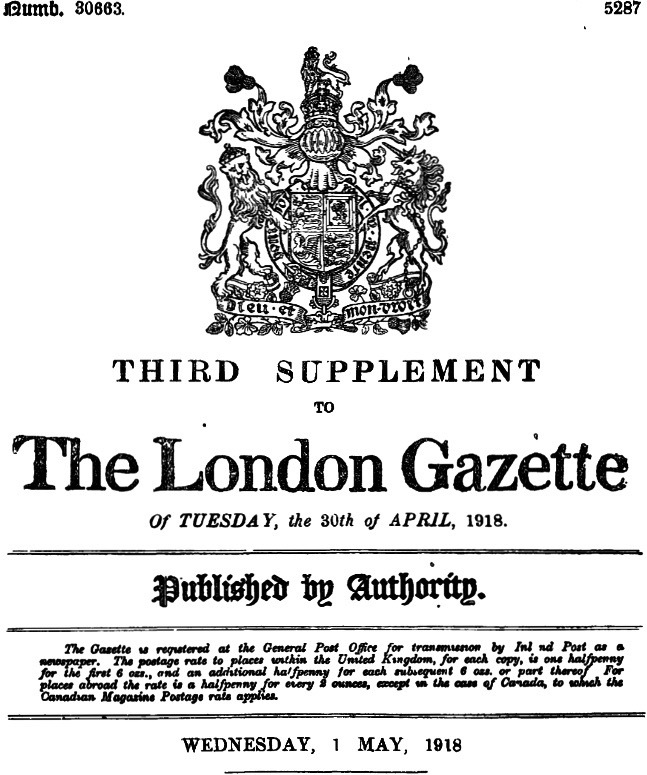 ¹ The Royal Flying Corps and the Royal Naval Air Service were combined to create the Royal Air Force, 1 April 1918. Whilst flying with his observer (Lt. A. W. Hammond, M.C. ), attacking hostile formations by bombs and machine-gun fire, he was assailed at a height of 5,000 feet by eight enemy triplanes, which dived at him from all directions, firing from the r front guns. By skilful [sic] maneuvering he enabled his observer to fire bursts at each machine in turn, shooting three of them down out of control. By this time Lt McLeod had received five wounds, and whilst continuing the engagement a bullet penetrated his petrol tank and set the machine on fire. He then climbed out on to the left bottom plane, controlling his machine from the side of the fuselage, and by side-slipping steeply kept the flames to one side, thus enabling the observer to continue firing until the ground was reached. The observer had been wounded six times when the machine crashed in “No Man’s Land,” and 2nd Lt McLeod, notwithstanding his own wounds, dragged him away from the burning wreckage at great personal risk from heavy machine-gun fire from the enemy’s lines. This very gallant pilot was again wounded by a bomb whilst engaged in this act of rescue, but he persevered until he had placed Lt. Hammond in comparative safety, before falling himself from exhaustion and loss of blood. Alan Arnett McCleod was born 20 April 1899 in the village of Stonewall, Selkirk, Manitoba, Dominion of Canada. He was the first of two children of Alexander Neil McLeod, M.D., a physician, and Margaret Lillian Arnett McLeod. After previously being turned away due to his age, Alan McLeod joined the Royal Flying Corps Canada (R.F.C.C.) 20 April 1917—his 18th birthday. He was sent to the University of Toronto for military training, then to Long Branch and Camp Borden for flight training. He was commissioned a Temporary 2nd Lieutenant (on probation), 19 August 1917. On 20 August 1917, 2nd Lieutenant McLeod boarded the Canadian Pacific passenger liner S.S. Metagama and sailed to Bantry Bay, Ireland. For the next four months McLeod continued to train as a pilot in the Royal Air Force. He then joined No. 2 Squadron on the Western Front. Following the action of 27 March 1918, Lieutenant McLeod spent a long period of time recovering from his wounds. It was decided to send him home to Canada. 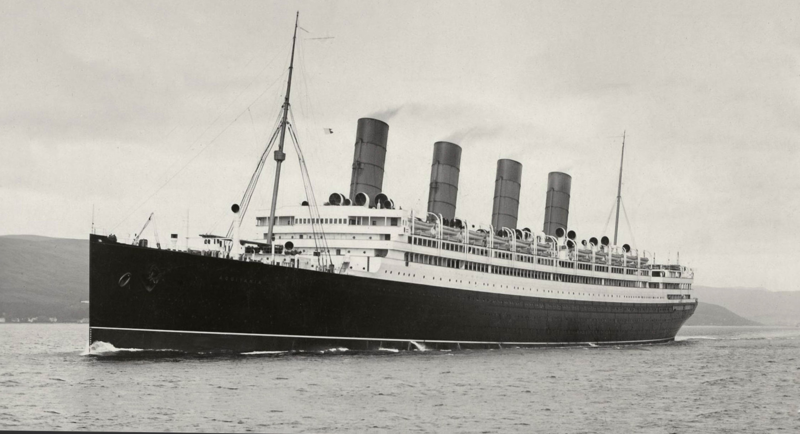 On 20 September 1918, he sailed from Southhampton aboard the Cunard liner R.M S. Aquitania. The ship arrived at the Port of New York, 27 September. Lieutenant McLeod then traveled to his home in Stonewall. 2nd Lieutenant Alan A. McLeod, V.C., sailed home from Europe aboard R.M.S. Aquitania, 20–27 September 1918. 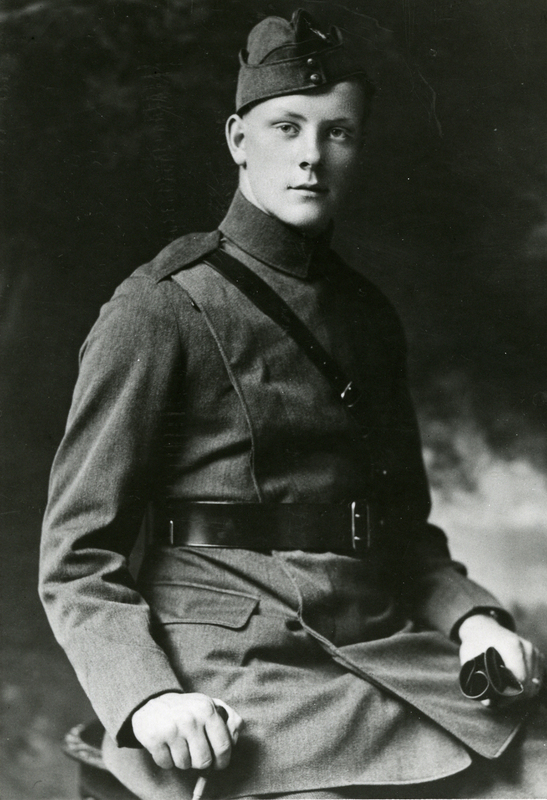 On 29 October 1918, Lieutenant McLeod was admitted to Winnipeg General Hospital in Winnipeg, Manitoba, diagnosed with the Spanish Flu, then a worldwide epidemic. 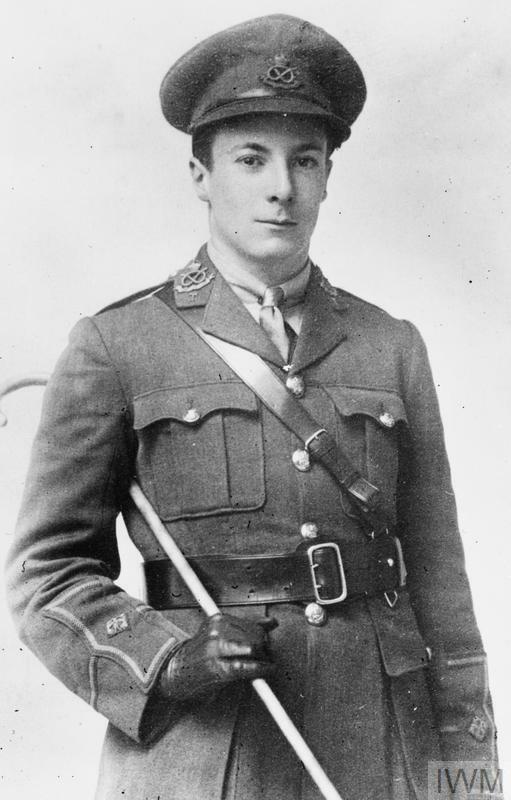 2nd Lieutenant Alan Arnett McCleod, V.C., Royal Air Force, died 6 November 1918. He was just 18 years old. The Armstrong Whitworth F.K.8 was a been designed by Dutch engineer Frederick Koolhoven. It was a single-engine, two-place, two-bay biplane. The F.K.8 was 30 feet, 8 inches (9.347 meters long). Both upper and lower wings had a span of 43 feet, 0 inches (13.106 meters), and chord of 6 feet, 6 inches (1.981 meters). The upper wing area was 270 square feet (25.1 square meters), and the lower, 254 square feet (23.6 square meters). The vertical gap between the wings was 5 feet, 11 inches (1.803 meters) and the lower wing was staggered 1 foot, 7½ inches (0.495 meters) behind the upper. Both the upper and lower wings had an angle of incidence of 2¼°, no sweep, and 4° dihedral. The F.K.8 had an empty weight of 1,720 pounds (780 kilograms), and gross weight of 3,000 pounds (1,361 pounds). The F.K.8 was powered by a water-cooled, normally-aspirated 13.937 liter (850.481-cubic-inch-displacement) Beardmore Aero Engine, Ltd., 160-h.p. inline six-cylinder engine with a compression ratio of 4.85:1. The engine was direct drive, and although it was identified as “160 h.p.”, it actually produced 154 horsepower at 1,400 r.p.m. The engine was 57 inches (1.148 meters) long, 19.9 inches (0.505 meters) wide and 31.9 inches (0.810 meters) high. It weighed 545 pounds (247 kilograms). The airplane had a maximum speed of 102 miles per hour (164 kilometers per hour) at Sea Level, and 98 miles per hour (158 kilometers per hour) at 10,000 feet (3,048 meters). It could climb to 10,000 feet in 20 minutes. Its ceiling was 20,000 feet (6,096 meters). It carried fuel for 3.75 hours of flight. The F.K.8 was armed with two machine guns, and carried a wireless apparatus. 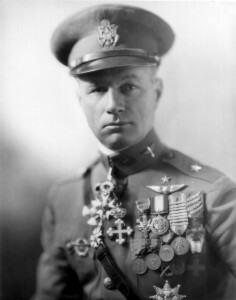 9 March 1918: Captain James Ely Miller, commanding officer, 95th Aero Squadron, 1st Pursuit Group, American Expeditionary Force, accepted the invitation of Major Davenport Johnson to join him and Major Harmon for a short patrol over the lines in three SPAD S.VII C.1 fighters borrowed from a French squadron. Major Harmon’s SPAD had engine trouble and he turned back. Major Johnson and Captain Miller continued and encountered four German fighters near Juvincourt-et-Damary in northern France. Shortly after the air battle began, Major Johnson abandoned the fight, leaving Captain Miller on his own. Captain Miller was shot down near Corbény, France. 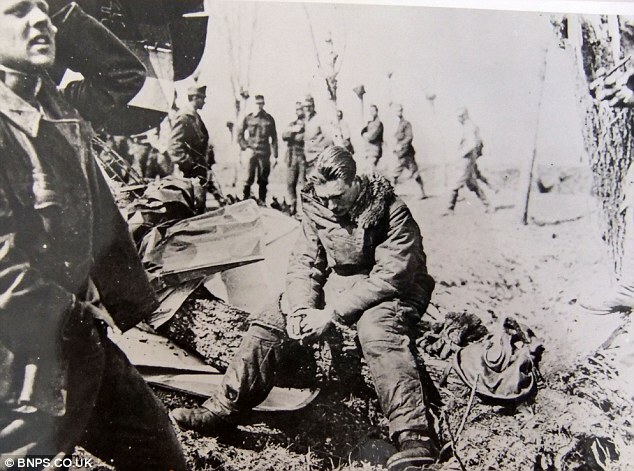 The German pilot who downed Miller and a German intelligence officer who had rushed to the crash scene witnessed Captain Miller’s dying words in which he cursed Major Davenport Johnson for leaving him during the air battle. On 12 March, Major Johnson assumed command of the 95th. 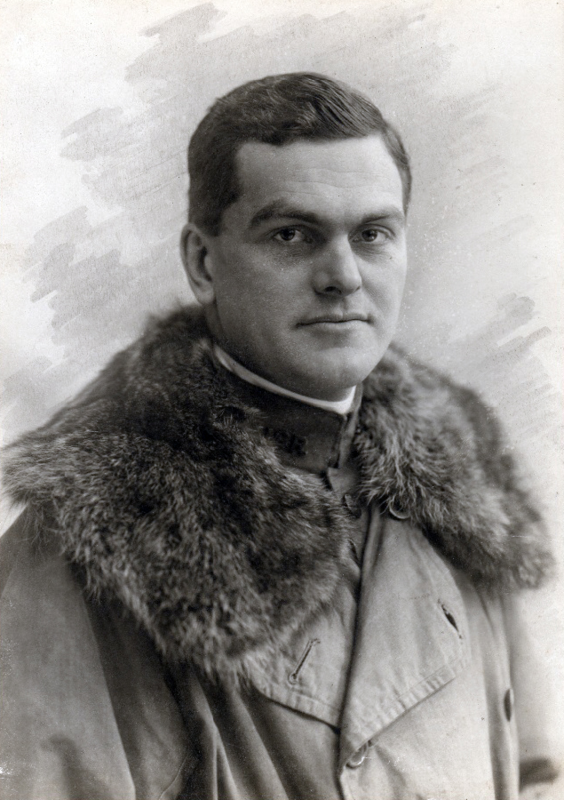 Captain James Ely Miller, 95th Aero Squadron, 1st Pursuit Group, American Expeditionary Force. James Ely Miller was born 24 March 1883 in New York City, New York. 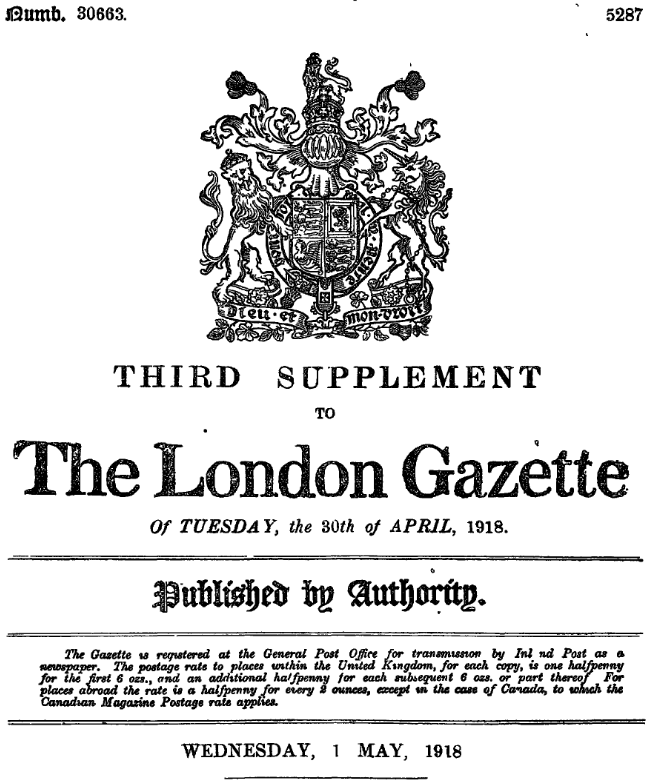 He was the fifth child of Charles Addison Miller and Mary Eliza Ely. Miller attended Yale University, graduating in 1904. He was a member of the Psi Upsilon (ΨΥ) fraternity. Miller was active in sports, a member of the varsity crew and played guard on the football team. Following university graduation, Miller joined the Knickerbocker Trust Company of New York (later, the Columbia Trust Co.), one of the largest banks in the United States. By 1913, he was secretary of the corporation, and by 1917, a vice president. Miller was 6 feet, 2½ inches (1.89 meters) tall, with brown hair and eyes, and a fair complexion. Miller married Miss Gladys Godfrey Kissel, 2 April 1908, in Manhattan, New York City, New York. They would have a daughter, Gladys Caroline Morgan Miller. 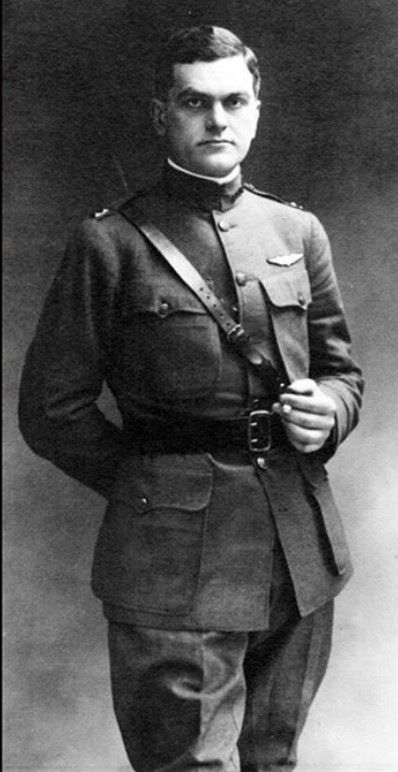 1st Lt. Miller flew with the 1st Aero Squadron, New York National Guard, in the Punitive Expedition into Mexico, in 1916. 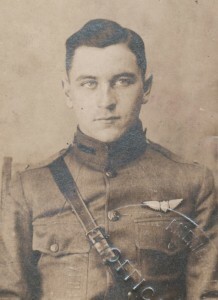 On 10 May 1917, Captain Miller was activated from the Officers Reserve Corps and assigned to the Aviation Section, Signal Corps, for duty in France. He served overseas from 23 July 1917 until his death. Captain Miller was the first United States airman to be killed in combat. In 1919, Miller Field, Staten Island, New York, was named in his honor. His remains were buried at the Oise-Aisne American Cemetery, Fère-en-Terdenois, France. On 14 June 2017, the Distinguished Flying Cross was posthumously awarded to Captain Miller. Secretary of the Army Robert M. Speer presented the medal to Byron Derringer, Captain Miller’s great-grandson. 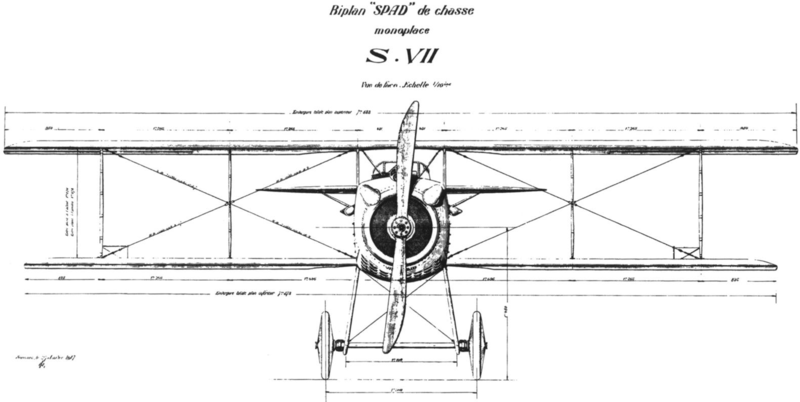 The Société Pour L’Aviation et ses Dérivés SPAD S.VII C.1 was a single-place, single-engine, two-bay biplane chasseur (fighter). The airplane was 19 feet, 11 inches (5.842 meters) long, with a wingspan of 25 feet, 7¾ inches (7.817 meters) and overall height of 7 feet, 2 inches (2.184 meters). It had a maximum gross weight of 1,632 pounds (740 kilograms). 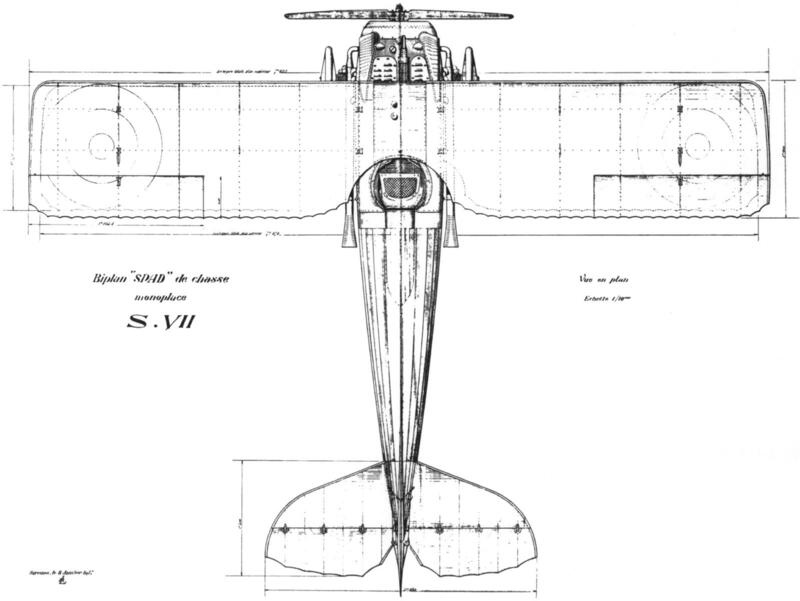 The SPAD VII was initially powered by a water-cooled, normally-aspirated, 11.762 liter (717.769 cubic inches) Société Française Hispano-Suiza 8Aa, a single overhead camshaft (SOHC) 90° V-8 engine with a compression ratio of 4.7:1. The 8Aa produced 150 horsepower at 2,000 r.p.m. By early 1918, the S.VII’s engine was upgraded to the higher-compression 8Ab (5.3:1), rated at 180 horsepower at 2,100 r.p.m. 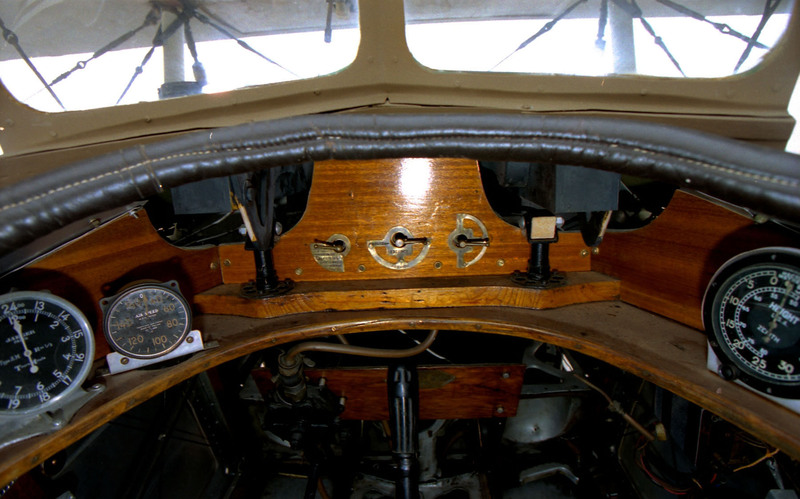 These were right-hand tractor, direct-drive engines which turned a two-bladed fixed-pitch wooden propeller. The SPAD VII had a maximum speed of 119 miles per hour (192 kilometers per hour). The 8Ab engine increased this to 129 miles per hour (208 kilometers per hour). The service ceiling was 17,500 feet (5,334 meters). Armament consisted of a single air-cooled Vickers .303-caliber (7.7 × 56 millimeter) machine gun, synchronized to fire forward through the propeller arc. The SPAD S.VII was produced by nine manufacturers in France and England. The exact number of airplanes built is unknown. Estimates range from 5,600 to 6,500. 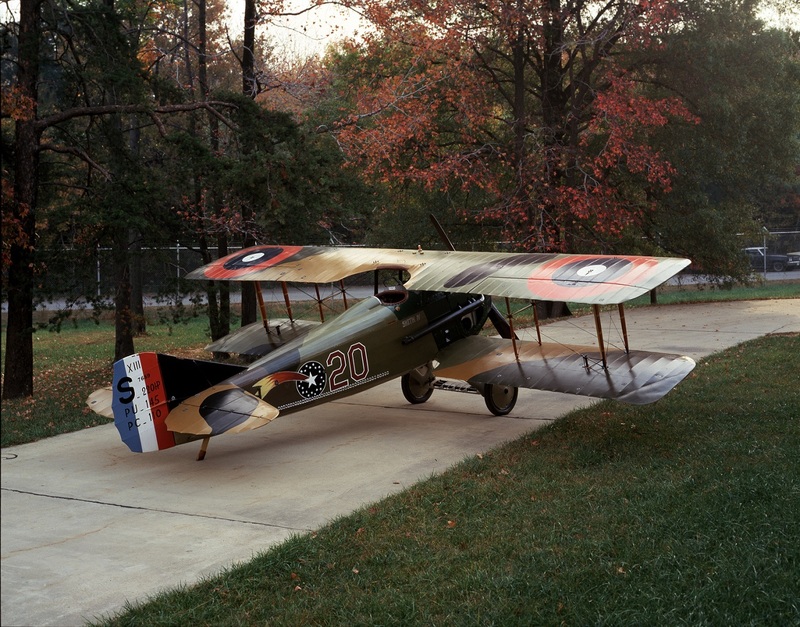 The airplane in this photograph is a SPAD S.VII C.1, serial number A.S. 94099, built by Société Pour L’Aviation et ses Dérivés, and restored by the 1st Fighter Wing, Selfridge Air Force Base, Michigan. It is in the collection of the National Museum of the United States Air Force, Wright-Patterson Air Force Base, Ohio.